I’ve been following Wendy’s for a few months now. I like its public relations and marketing. I had written about the fast-food company in my Public Relations course last semester, and now they’re returning for a blog post for my Digital and Social Media course! In class last Wednesday, we discussed crowdsourcing: when a company takes a job that was once performed by employees and outsources it in the form of an open call to a large undefined group of people, generally using the Internet. The best example of crowdsourcing is Wikipedia, a website where the collective comes together to create a giant encyclopedia of knowledge. The examples we talked about in class mostly had to do with design, like having someone else design your stationery. I don't like promoted tweets in my news feed, but this'll do. Wendy’s recently crowdsourced by putting out an “open call” on Twitter for a T-shirt design contest. The winner receives $5,000 and the honor of using the T-shirt to fundraise for the Dave Thomas Foundation for Adoption. 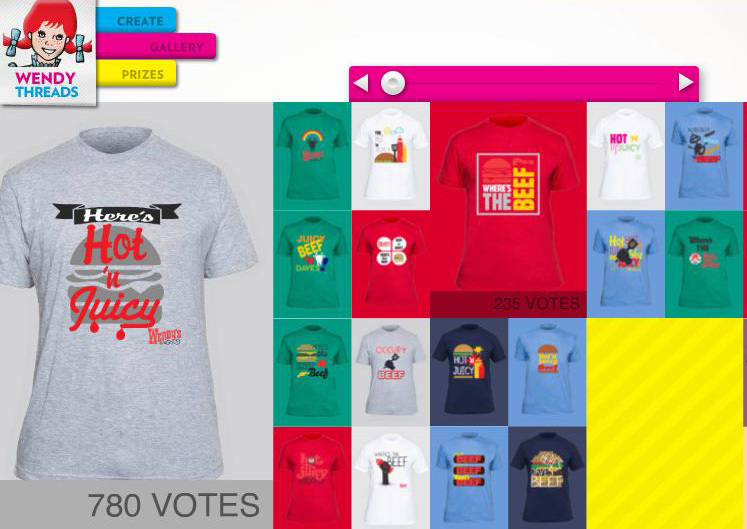 Once people have designed the T-shirts, others can vote on them. The design with the most votes wins. This is a clever tactic by any company for two reasons. 1) Although they are still paying the winner like they would with a professional designer, Wendy’s receives numerous options. To date, the contest has gotten 9,467 submissions. 2) The people decide the design. This is extremely important because these people are the ones who are going to buy this T-shirt. With guaranteed sales, Wendy’s will have no problem paying the grand prize, the cost of the T-shirts and make a lot of money for its charity.